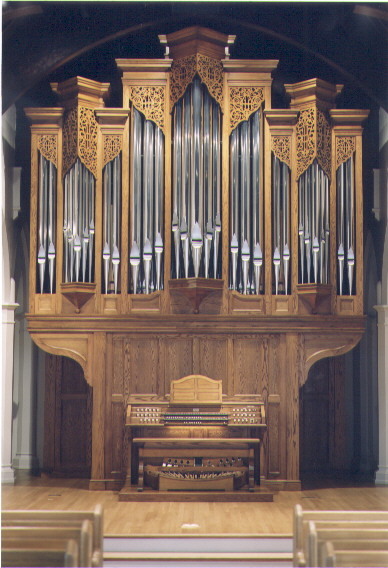 In 1998 as part of the church renovation and expansion, the Saint Mary's organ was installed by Lively-Fulcher Pipe Organ Builders of Washington, D.C. This organ was crafted foremost to support hymn singing, accompany choral anthems and play organ literature spanning many periods. The instrument currently has 25 speaking stops with preparations for two further voices to be added as funds permit. The key action is mechanical and the stop action is electric, complete with combination action and eight levels of memory. The tonal inspiration for the instrument is firmly based in England but with a dash of French color and exuberance that was so common in English-built organs of the 18th and 19th centuries. The support of the robust hymn singing coupled with the varied and ambitious choral program at Saint Mary's is the driving force behind the tonal aesthetic of the instrument.